LG baffles us by showing off a new 47" Full HD TV that uses only 28W. The high energy efficiency is achieved by using a single vertical edge backlight with a brightness of 400 nits. LG Display, a leading innovator of thin-film transistor liquid crystal display (TFT-LCD) technology, today announced it has developed a 47-inch Full HD LCD panel, featuring vertical single side LED backlight technology, that offers maximum brightness while consuming less electricity than other LCD TV panels over 40 inches in size and even normal PC monitors over 20 inches in size. The newly developed LCD panel achieves the world's lowest power consumption rate among large LCD panels by dramatically reducing the number of LED lamps used while maintaining a high level of brightness. To reduce the quantity of LED bulbs used, LG Display introduced its own backlight technology in which LED lamps are attached vertically to a single side of the panel, a world first for such technology. 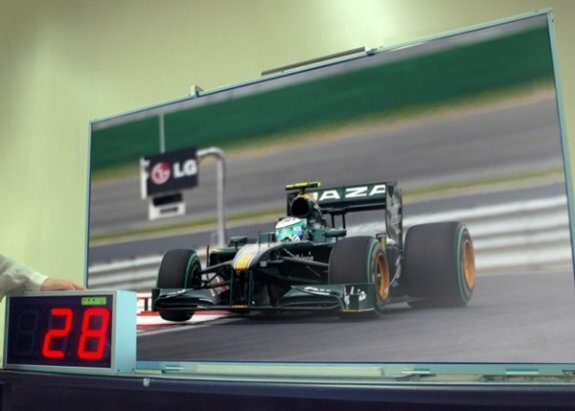 Despite its large size, the 47-inch LCD panel uses only 28W, less than the power consumption of most 20-inch PC monitors which use between 30~50W. The LCD panel also delivers 400 Nits of brightness suitable for HD TVs through a three-film structure which helps focus and diffuse light, together with Local Dimming Technology and energy efficient LED bulbs. Making it ideal for commercialization, the 47-inch LCD panel offers outstanding picture quality through its full HD resolution and ultra-slim design highlighted by its minimal 8.5mm bezel, in addition to its improved energy efficiency which will ensure cost savings for consumers. "Together with our business partners, LG Display has developed this LCD technology to continue our commitment to improving energy efficiency with environmentally friendly solutions," said Shin Ho Kang, vice president and head of LG Display's LED Development Department. "We will continue to invest in developing more energy efficient technologies that can bring greater value to both the market and the environment."